Spend another £16.46 to get FREE DELIVERY! 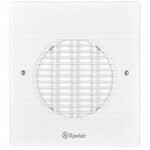 WX6T 6″ high performance single speed extract wall fan with an over-run timer that continues to extract air for between 2 and 20 minutes after the fan is switched off, internal electro-thermal shutter, plastic wall liner and grey external grille. Unit is operated by an external on/off switch or sensor. WX commercial duty wall fans are designed for pubs, restaurants, offices, kitchens, factories, schools and shops. Suitable for single, cavity brick and timber frame walls and available in 6″, 9″ and 12″ sizes. The low profile white fascia is styled to blend in cleanly with commercial surroundings. For safety, a finger-guard is integrated into the ultra slim high gloss ABS fascia and the exterior wall grille design. On WX9 and WX12 units a positive plug and socket assembly provides a means of isolation. All WX models come complete with a wall mounting kit which includes a cut to size corrugated plastic wall liner or ‘Safe Lock’ metal telescopic wall liner. Both the WX9 and WX12 are reversible and feature totally enclosed external rotor motors. Running costs are impressively low, and when not in use the silent electro-thermal shutter cassette closes silently against backdraughts.